One of the first things I bought when I experimented with veganism was a cookbook. It seemed like the right thing to do, as most of my collection at the time was heavily based around titles like “Everything Bacon” and “The Best Things Come with a Side of Meat.” I purchased Vegonomicon – The Ultimate Vegan Cookbook, and discovered several dishes that, even back to my non-vegan diet, I still make on a regular basis. 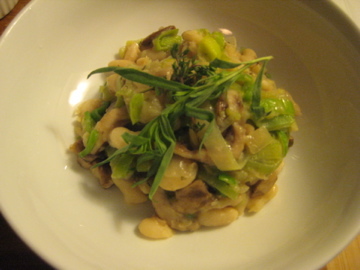 I will admit that when cooking Rustic White Beans and Mushrooms now, I add butter and the rind from a piece of Parmesan Reggiano, thus rendering it truly un-vegan, but all the more delicious. This dish is easy enough to make any weeknight, makes the whole house smell nice, and is particularly good if you’re an athlete looking for some interesting non-meat protein. Behold, my notes on how to prepare this recipe. 1. Buy some dried white beans. 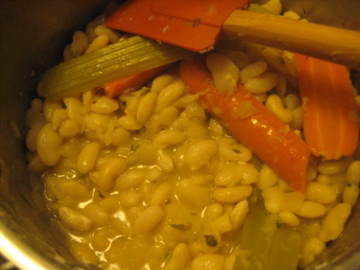 You can not use canned beans for this (I tried – no go). In the morning, before you leave for work, put 2 cups of these beans in a bowl and cover them with water. Now, conventional wisdom says these beans need to soak for 8 hours, but you can get away with 4. Note: If you get home and realize you’ve forgotten to soak the beans altogether, you can still make this recipe. Boil the beans for 3 minutes, then soak for 2 hours, then proceed with cooking. 2. Drain and rinse your soaked beans, transfer to a large pot. Add 4 cups of cold water, cover, and bring to a boil. (Yes, if you took the soaking shortcut, you still boil them). Let the beans boil for 3 minutes (careful, at this point your pot will try to overflow), then skim off any white foam and lower the heat to medium. Add 1 small carrot, 1 stalk celery, 1 small chopped onion, 1 tsp dried thyme (or 1 tbsp fresh thyme- dried herbs are more potent than fresh), and 2 tbsp fresh tarragon. Cover and simmer for 45 minutes. 3. 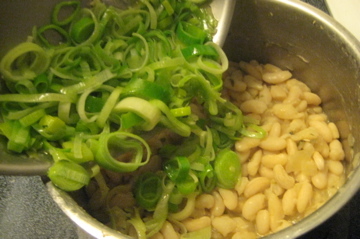 Once you have about 15 minutes left on the clock, check the beans- they should be starting to resemble a thick stew, not a soup. (This is the point at which I usually add some parm rind, for flavor). 4. About 10 minutes before the beans are due to be done, put two minced cloves of garlic in a pan with a few swirls of olive oil. Note: If you’re not actually vegan, throw a chunk of butter in there as well. I’m sorry, but it really makes the dish- it becomes much creamier and richer (big surprise). 5. 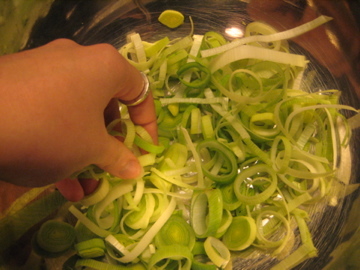 Add 1 thinly sliced leek. But first, a word about leeks. Leeks are great, once you know how to prepare them. They can hold on to some grit, so once you cut them, separate them with your fingers in a big bowl, then cover with water and swish them around, drain, and pat dry with a towel. 6. 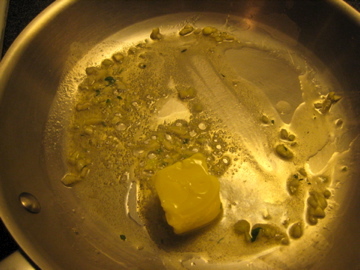 Once dry, add them to the pan with garlic and olive oil (and contraband butter), and saute for 2 minutes until soft. 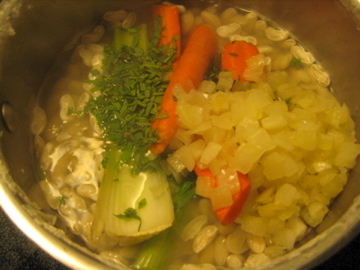 Remove the celery and carrots from beans, then add leeks to the pot. Remember, the beans should still be cooking over low heat at this point. 7. 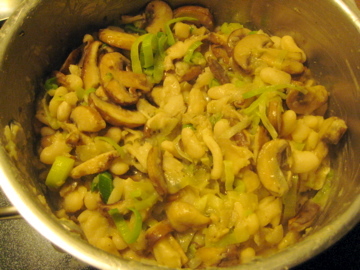 Saute 1/2 lb of mushrooms – preferably a combination of cremini, shiitake, and oyster- until they have released most of their liquid, season with salt and pepper, and add to beans. Turn off the heat and season with salt and pepper. I also like to add at least 1 tbsp of lemon juice to brighten it up a bit. 8. You can serve this over risotto, polenta, couscous, or, as I prefer it, plain. Voila!